Maverick Viñales gets his first taste of Michelin tyres and impresses many as he ends the test in second. 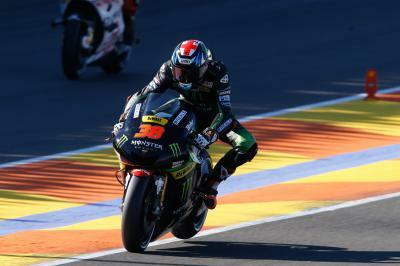 There were various Michelin tests with full time MotoGP™ riders during the 2015 season but Team Suzuki Ecstar and Maverick Viñales opted not to participate so the rookie could focus all of his attentions on the 2015 season. 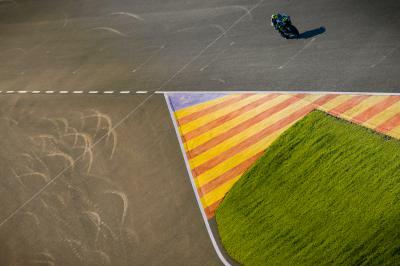 With no prior experience on the new tyres, Viñales astounded many as he ended the two day Valencia test in second with a 1’31.163, just 0.103s shy of Repsol Honda’s Marc Marquez. Viñales chose not to test the new 2016 electronics in order to fully understand the differences in the new tyres. 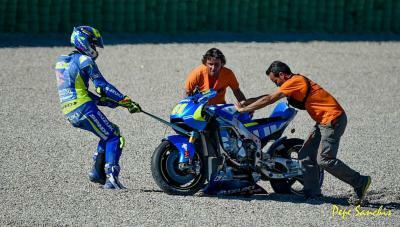 Suzuki will now head to Sepang for a private test at the end of November before the winter testing ban. The official Sepang test in February will see Suzuki debut their 2016 bike, only the current 2015 model being used during the Valencia test. 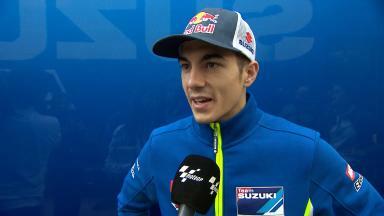 Maverick Viñales: “This day has been positive for us, we could continue improving and my feeling is getting better and better. In these two days we have only tested the new tyres, because they were completely new for me and I needed to focus on their feeling, and I must say that I feel very comfortable. We still have a lot to do and so many areas that can be improved, but this is positive because today we started to better understand some behaviour of the bike on the tyres and make some first plans for future development. The grip at the rear is very positive, it gives me much confidence and I can take different lines around the circuit that I prefer. 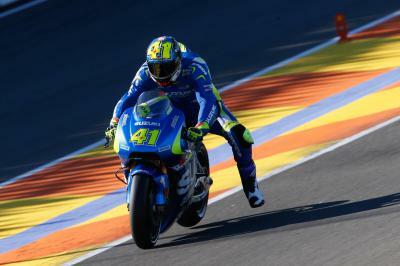 Three crashes prompt Aleix Espargaro and his Team Suzuki Ecstar crew to radically change his GSX-RR during the Valencia Test. 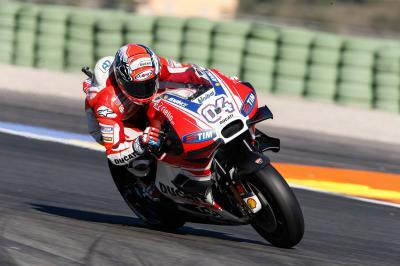 A steady start to the 2016 season for Andrea Dovizioso as he completes 128 laps of the Valencia circuit during testing. 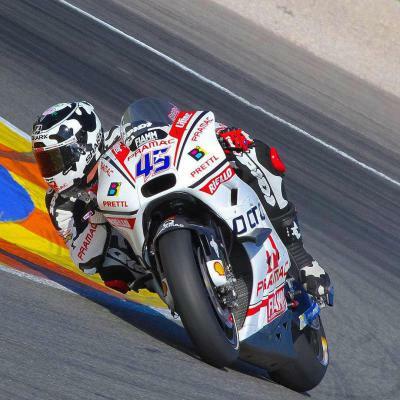 Danilo Petrucci adapts to life on the GP15 as he begins to prepare for the 2016 season with Michelin tyres. Laverty: “On just my second outing I matched my best lap"
Three crashes didn’t dampen Eugene Laverty’s spirits as he debuted on the GP14.2 in Valencia. 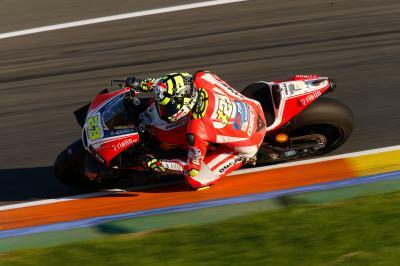 Iannone: “I am quite satisfied, but not with the result"
The Valencia test ends with Andrea Iannone leading the Ducati charge but unable to break into the top five. 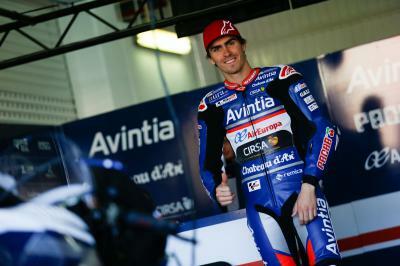 A great Ducati debut for Loris Baz as he and his Avintia Racing team work on perfecting the Frenchman’s rider position. Check out all of the reactions from the riders after the two-day Valencia test that officially kicked off the 2016 MotoGP™ season. 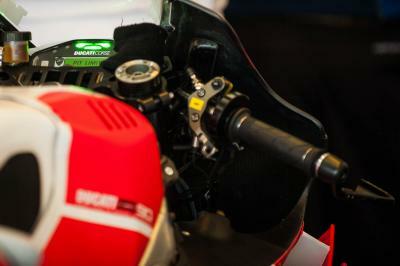 After two days of testing with Michelin tyres in Valencia, Alvaro Bautista reveals there is still work to be done. 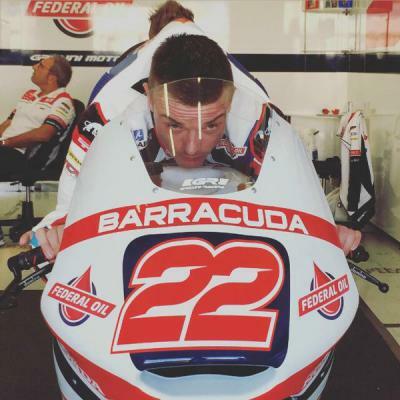 A positive first test for Bradley Smith as he samples the Michelin tyres and the Yamaha M1 he will ride in 2016. Well first test done with @pramacracing, I have to say i am really happy with the team and the bike, i already feel at home!